Today we're going to talk about a quote by painter Bob Ross, who many people know & love from his PBS series, The Joy of Painting. It originally aired from 1983 to 1994, but is still being watched & enjoyed by many thanks to the internet! What I want to encourage you to recognize, is that those "mistakes" we all make in our creative endeavors often lead to something much more wonderful, if we let them. Sometimes the only thing standing between a creative mistake & those happy little accidents that Bob Ross talks about, is our harsh judgement of ourselves & our work. And then, instead of keeping an open mind & pondering things a bit - we abandon ship, just when it's most important to keep going! I'm guilty of this almost everyday of my creative life. But then I'm reminded of this quote, take it to heart, and then draw on the patience & wisdom deep down inside (sometimes wayyyyyyyy down deep lol). So I put my brush aside, step away from my "mistake", and try to see what I can see. And what I want to remind you to do when you're feeling dismayed with your creative process, is to put YOUR "brush" aside, and consider your options. Put down your pencil, fabric, carving knife, knitting or crochet needle, the quilt you're working on, your camera, your word document, your saw or drill or blow torch, your spatula & oven mitts. Whatever it is you use to create. If you find yourself in over your head & don't like where your creation is going, then step away slowly ... but surely. Take a deep breath, turn off that silly critical spigot in your head, and then see what you can see. Look for a way to turn that "problem" into a happy little accident. My very first "abstract" painting! I know for certain that it's a constant struggle to ignore that judgmental, critical voice when we're creating, and instead choose to stay present to see what we can see. But with practice, Bob Ross & I promise it gets easier! I'll leave you with the painting I did as a demo during a class I taught last Thursday night. It has many happy accidents that add real interest & beauty to the piece. But for those to appear (& also remain), I've had to train my mind over & over again to ignore my inner critic, and just "allow" these to happen. And you can too, if you aren't already. As a side note, and as a dedication to the life of my beautiful parents... 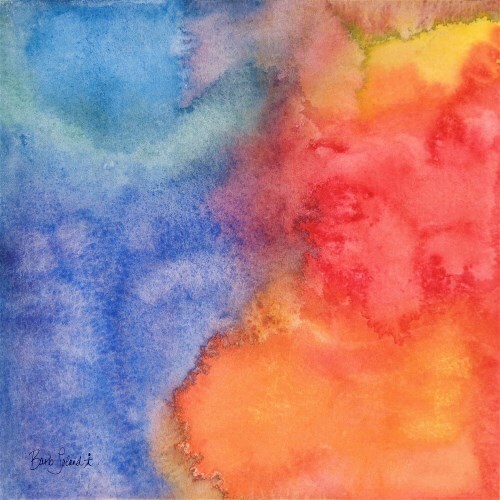 I see (in hindsight) that Mom's spirit was passing while I was demonstrating this painting at a class two days before I got the call from my brother that she died. I'm a firm believer that the spirit begins transitioning before the physical heart stops beating. 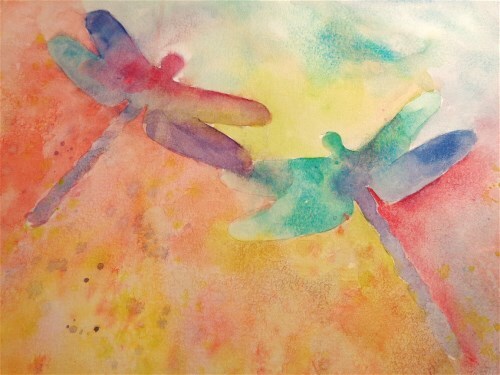 Having long associated dragonflies with my Dad, I now see it as a sign that he was lifting Mom up to be with him again, right at that very moment when my brush was touching the canvas. Call this coincidence, or divine intervention. 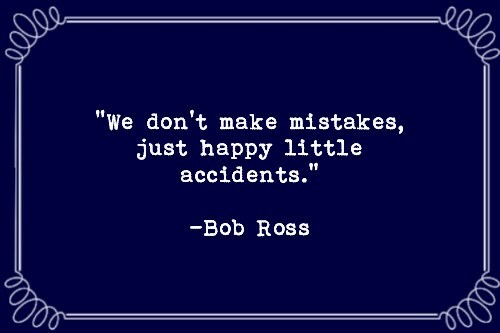 Just like "mistake" vs. "happy little accident" - the choice is yours! It will hopefully serve to remind you to stay present, embrace those "mistakes", and realize that your life is full to the brim with happy little accidents.